Myeloma bone disease (MBD) can cause bone destruction and increase the level of Ca2+ concentration in the bone marrow microenvironment by stimulating osteoclastic differentiation. Nevertheless, the relationships between MBD and highly efficient stimuli of Ca2+ in multiple myeloma (MM) progression, and possible regulatory mechanisms are poorly defined. Here, we reported that the nonselective cation channel transient receptor potential vanilloid 2 (TRPV2) plays a functional role in Ca2+ oscillations and osteoclastogenesis. To investigate the expression of TRPV2 in MM, we analyzed publicly available MM data sets and performed immunohistochemistry in MM patients. The correlations between TRPV2 expression levels and osteoclast-related cytokines were analyzed. Fluo-4 staining and ELISA assays were used to assess the regulated function of TRPV2 in intracellular Ca2+ and cytokines. 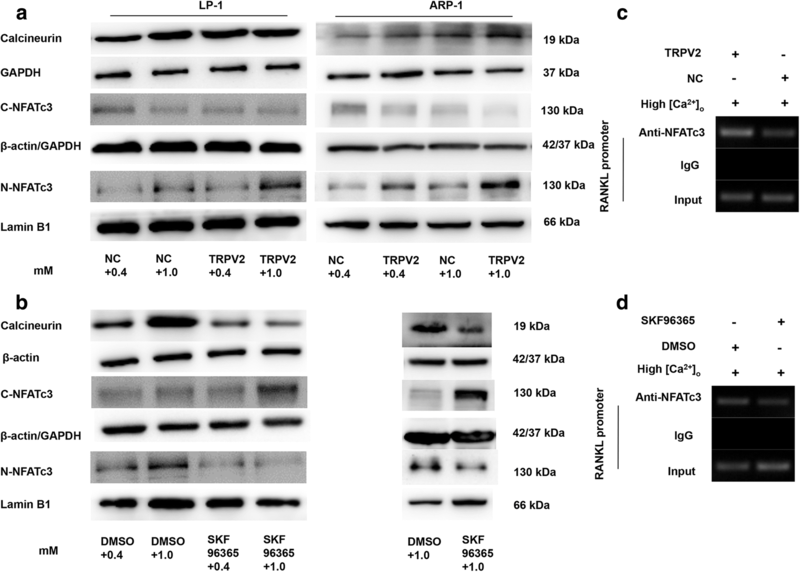 Western blotting and Chromatin immunoprecipitation (ChIP) assays were performed to explore the signaling pathway of TRPV2-induced osteoclastic differentiation. Real-time PCR, Western blotting, ELISA and tartrate-resistant acid phosphatase (TRAP) staining were performed to detect the biological effects of TRPV2 inhibitor on osteoclastogenesis. The functional expression of TRPV2, involved in the osteolysis through gating the calcium influx, was changed in the MM cells cultured in a high Ca2+ environment. 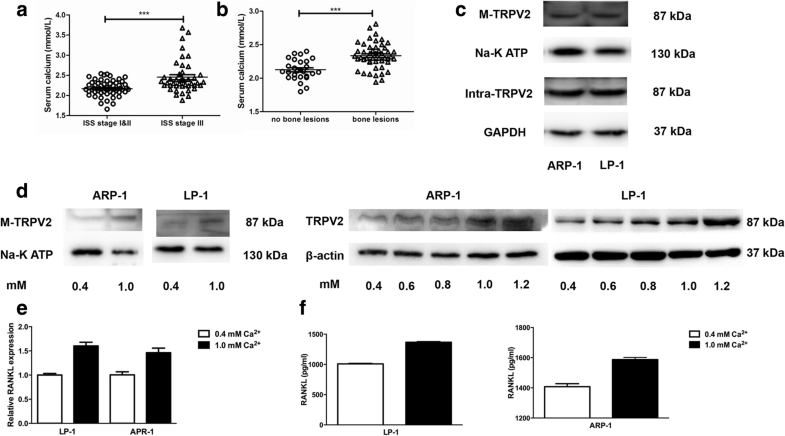 Mechanistically, TRPV2 modulates nuclear factor-κB ligand (RANKL)-dependent osteoclastic differentiation through the Ca2+-calcineurin-NFAT signaling pathway. Of clinical relevance, systemic administration with SKF96365 could attenuate the MM-induced osteoclast formation in vitro. Our study uncovers the possible roles of TRPV2, which enhances MBD, suggesting that targeting osteocyte-MM cells interactions through blockade of TRPV2 channel may provide a promising treatment strategy in MM. Approximately 80% patients with multiple myeloma (MM) present with bone lesions, hypercalcemia, fractures or bone pain during the course of disease [1, 2]. The abnormal calcium reabsorption in renal tubules leads to hypercalcemia in myeloma, which induces the dysregulated bone remodeling [3–5], and Ca2+ ions are directly released into the bone matrix during bone remodeling . Ca2+ concentration is found to be elevated in the serum and bone marrow microenvironment of MM patients, which is positively correlated with myeloma bone disease and hypercalcemic crisis. Moreover, the elevated Ca2+ accelerates myeloma bone destruction and reabsorption through MM-osteoclast (OCL) interactions [7, 8]. However, it is not clear whether MM cells under high level of extracellular calcium concentration ([Ca2+]o) could regulate the differentiation of osteocytes under exposure to in the bone marrow microenvironment surrounding bone destruction. Intracellular Ca2+ ([Ca2+]i) could act as an secondary messenger involved in multiple cellular functions, including inflammation, molecular transportation and gene transcription . In different cells, the plasma membrane Ca2+-permeable channels are involved in Ca2+ influx [10, 11]. Calcium-sensing receptor (CaSR) was activated by extracellular Ca2+, which promoted bone metastasis in renal cell carcinomas . Moreover, many Ca2+ channels might associate with osteoclasts,and highlights that the locally increased extracellular Ca2+ could induce osteoclastic differentiation . However, whether myeloma cells possess the ability to response the changes in extracellular calcium concentration, and which [Ca2+]i signaling pathways involved in high Ca2+-induced osteoclastic differentiation in MM have not been fully elucidated. One candidate for a Ca2+-sensing channel that could be expressed on MM cells is the transient receptor potential vanilloid type 2 , which is Ca2+ permeable channel contributing to calcium homeostasis . TRPV2 is widely expressed in different organs and tissues . Notably, the expression of TRPV2 was up regulated in MM patients . Since TRPV2 is also highly expressed in MM cells , we assume that TRPV2 might act as a mediator to transmit Ca2+ into MM cells. In this study, we reported that the activation of TRPV2 by high [Ca2+]o increases the osteoclastic activity. Mechanistically, TRPV2-induced Ca2+ influx modulates calcineurin-NFAT activity and mediates the release of RANKL in MM cells. This investigation of RANKL-mediated osteoclastic differentiation via TRPV2 in MM cells may shed a light for the treatment of myeloma bone disease. 90 newly diagnosed MM patients were recruited from January 2013 to March 2016 in the First Affiliated Hospital of Nanjing Medical University. MM was diagnosed according to the 2008 World Health Organization (WHO) criteria. All medium were supplemented with 10% fetal bovine serum (Gibco, USA). All cells were maintained in a 5% CO2 cell culture incubator. Cells were transfected with different lentiviral constructs (carrying whole TRPV2 transcript or an empty negative control vector) and harvested at day3 post-transfection for analysis. Cells were transfected with a siRNA for TRPV2 (Ribobio Technologies) or scrambled siRNA as a negative control using lipofectamine 3000. Transduction efficiency was determined by Western blotting. Gene Expression Omnibus (GEO) data were carried out to examine the expression of transient receptor potential channels in MM patients (GSE24080) and MM cell lines (GSE6205) . Data acquisition and normalization methods in these datasets have been described previously . The mRNA expression of TRPV2 (GSE2658) in plasma cells was determined using the Affymetrix U133Plus2.0 microarray (Affymetrix, USA), which were performed as previously described . Protein extracts or nuclear protein extracts were electrophoresed on polyacrylamide gels, blotted, and then incubated with primary antibodies overnight (4 °C). Lamin B1 and NFATc3 (Proteintech, USA); MMP-9, P53, GAPDH and β-actin (Cell signaling Technology, USA); TRPV2 (Alomone, Israel); Cathepsin K (Bioworld, USA); calcineurin (Cusabio, China); secondary antibodies (Vazyme Biotech, China), and then developed. Total RNA from cell lines was isolated and supplied to reverse transcription; qRT-PCR was done using a StepOnePlus RT-PCR System (Applied Biosystems, USA). GAPDH levels were used to normalize all genes expression levels. The sequences of primers were listed as following (5′-3′): GAPDH, sense, TTTGGTATCGTGGAAGGAC, antisense, AAAGGTGGAGGAGTGGGT; mice Cathepsin K, sense, GCGTTGTTCTTATTCCGAGC, antisense, CAGCAGAGGTGTGTACTATG; mice MMP-9, sense, GCTGACTACGATAAGGACGGCA, antisense, GCGGCCCTCAAAGATGAACGG; human RANKL, sense, AAGGAGCTGTGCAAAAGGAA, antisense, CGAAAGCAAATGTTGGCATA; TRPV2, sense, GGAGGAAGACAGGACCCTTGACA, antisense, TTCCCTTTCGGTAGTTGAGGTTGA; mice GAPDH, sence, AACGACCCCTTCATTGACCT, antisense, CACCAGTAGACTCCACGACA. BM tissues were harvested and fixed in 10% formaldehyde, and antigen retrieval was processed in EDTA-containing antigen retrieval buffer (pH = 8.0) in 95 °C,and followed by 3% H2O2 incubation for 30 min. Next,the samples were blocked by goat serum for 10 min, and incubated with Anti-TRPV2 antibody over night at 4 °C, the secondary antibody was incubated for 30 min before visualization by DAB reagent. Double-staining fluorescent immunohistochemistry was performed on fixed MM cells, and processed for Anti-TRPV2 antibody and Anti-CD38 antibody (Proteintech, USA). After incubation and wash, cells were incubated with secondary antibody conjugates (Invitrogen, USA) and DAPI was used to counterstain the nuclei. TNF-α, IL-1β and RANKL in conditioned media were quantified by commercially available ELISA kits (Yifeixue Bio Tech, China), per the manufacturers’ instructions. Chromatin immunoprecipitation (ChIP) assays were done using the ChIP Assay kit (Beyotime, China) according to the manufacturer’s instructions. Briefly, MM cells were cultured with [Ca2+]o or SKF96365 for 24 h. Treated cells were cross-linked with 1% formaldehyde in PBS for 10 min. Next, immunoprecipitation was utilized with NFATc3 antibody (5 μg) (Proteintech, USA) or IgG as negative control at 4 °C overnight. Protein A + G were used for pulling down immune complexes. Then, the complexes were washed out with elution buffer (1% SDS, 0.1 mol/L NaHCO3), and cross-linking reversed with NaCl at 65 °C for 4 h. DNA was purified and carried out with PCR amplification of the human RANKL promoter (− 1524 to − 1324 bp) using the following primers (5′-3′): sense, GATACACATATAAATGCTAA, antisense, CGCTAATGAGTATTTCTCTA. The results of RT-PCR were analyzed by image J.
RAW264.7 cells (a mouse macrophage cell line obtained from Keygene) were cultured with MM cell conditioned medium contained αMEM (ratio 1:1) or 10% fetal bovine serum contained αMEM in each experiment [21–24]. On the day of harvest, Raw264.7 cells were stained for TRAP using an Acid-phosphatase leukocyte staining kit (Sigma-Aldrich, USA). Osteoclasts were identified and enumerated under microscopy as TRAP+ cells with ≥3 nuclei/cell. AND LP-1 cells cultured in confocal dishes (Thermo Fisher, USA) were first loaded with 5 μM Fluo 4-AM in Hanks’ Balanced Salt Solution (HBSS) (final concentration of DMSO, 0.1%) at room temperature for 30 min protected from light, then washed twice in HBSS at room temperature. Image analysis was performed using Zen2011 software, and fluorescence of every cell in each field was measured. A Direct-reading ISE (ion-selective electrodes) analyzer was used for iCa2+ measurement in serum samples from randomly selected patients. Data are presented as mean ± SEM and analysis involved use of GraphPad Prism 5 (GraphPad Software, Inc., USA). Statistical analyses were performed using Student’s t-test or one-way analysis of variance (ANOVA). P < 0.05 was considered statistically significant. To assess the expression of TRPV2 channels in MM patients, we examined the protein expression of TRPV2 in bone marrow biopsy specimens from normal or MM bone marrow by immunohistochemistry. TRPV2 was upregulated in MM bone marrow compared to normal bone marrow (Fig. 1a and Additional file 1: Figure S1b). We also analyzed public gene expression data of bone marrow plasma cells from MM counterparts. In GSE24080, transcriptional level of TRPV2 in plasma cells of patients with shorter Event Free Survival (EFS, < 24 months) was significant higher as compared to patients with longer EFS (≥ 24 months) (Additional file 2: Figure S2a). Moreover, TRPV2 was overexpressed in patients with inferior overall survival (OS, < 24 months) as compared to patients with favorable OS (≥ 24 months) (P = 0.07, Additional file 2: Figure S2b). In GSE5900 and GSE2658, TRPV2 is overexpressed in MM patients compared with other donors, which have no bone lesions (NP, MGUS and SMM), so it indicated us the correlation between TRPV2 and bone lesions in MM (Fig. 1b). Furthermore, in GSE2658, MM patients with higher TRPV2 expression had shorter OS as compared to patients with lower TRPV2 expression (TT2 + TT3, Fig. 1c), which suggests the expression level of TRPV2 might affect the outcome of MM patients. Taken together, these results indicated that TRPV2 is highly expressed in MM patients and correlated with poor prognosis and bone lesions. Next, we explored mRNA expression of TRPV2 in MM cell lines. The Cancer Cell Line Encyclopedia (CCLE) database shows that TRPV2 expression is higher in MM cell lines, compared to other cancer cell lines, such as non-small cell lung carcinoma cells and neuroblastoma cells (Additional file 2: Figure S2 k). TRPV2 protein in MM cell lines ARP-1, LP-1 was obviously higher than U266, A549 and SH-SY5Y by Western blotting (Fig. 1d and Additional file 3: Figure S3 h). Moreover, we also examined the expression of TRPV2 in MM patients cells and normal donor cells (MNCs) by Western blotting in Fig. 1e, and TRPV2 protein was upregulated in MM patients cells. Presence of TRPV2 in MM cells was confirmed by immunofluorescence staining (Fig. 1f and Additional file 4: Figure S4a), both U266 and A549 were used as the negative control (Additional file 3: Figure S3 g and h), all three-cell lines have a high green fluorescence of CD38, but U266 and A549 have low red fluorescence of TRPV2, which indicated that TRPV2 is expressed at both mRNA and protein levels in MM cells. Myeloma cells are exposed to high level of [Ca2+]o with bone destruction . Therefore, we examined the expression of serum calcium concentration in 90 MM patients, which was significantly higher in patients with International Staging System (ISS) stage III than ISS stages I & II (Fig. 2a), and the serum calcium was higher in MM patients with bone lesions (≥ 1) compared to those without lesions (Fig. 2b). Additionally, there were no associations between serum calcium and patient clinical baseline characteristics (such as gender and age), as well as other established prognostic factors (such as ESR, CRP, and LDH). However, serum calcium was correlated with sCr and ALB levels, respectively (Additional file 5: Table S1). Collectively, our results indicated the key role for calcium in the pathogenesis of MBD. Next, we evaluated the effect of [Ca2+]o on the cell viability upon different concentrations by using trypan blue staining and flow cytometric analysis, we found [Ca2+]o could decrease cell viability after 7 days stimulation with 2.0, 2.8, 4.0, and 5.8 mM [Ca2+]o, respectively. After treatment with 0.4–1.2 mM [Ca2+]o for 12–48 h, the proliferation of myeloma cells remained unchanged at the concentration from 0.4 to 1.0 mM, but decreased significantly at 1.2 mM after 24, 36 and 48 h, respectively (Additional file 4: Figure S4a). Then, we investigated the level of plasma membrane expression of TRPV2 channels compare to the intracellular levels in MM cell lines ARP-1and LP-1, the results show that TRPV2 is expressed in both plasma membrane and intracellular (Fig. 2c). Notably, elevated protein levels of TRPV2 were detected after exposure to escalating concentration of [Ca2+]o (Fig. 2d), suggesting that [Ca2+]o might play role in regulating the expression of TRPV2. Based on the correlation between [Ca2+]o and TRPV2, we then utilized MM cells cultured in high calcium medium for further investigation. The previous studies reported the inflammatory cytokines, such as tumor necrosis factor (TNF)-α, interleukin (IL)-1β and nuclear factor-kappa B ligand (RANKL) promote osteoclastogenesis [26–28], here, we also found that the levels of RANKL were increased in a dose-dependent way after stimulation with 1.0 mM [Ca2+]o (Fig. 2e and f). Surprisingly, RANKL showed the increasing tendency with TRPV2 in high [Ca2+]o microenvironment. Taken together, high concentration of [Ca2+]o could increase the expression of TRPV2 and stimulate the secretion of osteoclast-related cytokines in MM cells. Next, we investigated the possible mechanism how TRPV2 regulates the secretion of cytokines. First, we successfully overexpressed the level of TRPV2 in ARP-1 and LP-1 (Additional file 6: Figure S5b). To determine the contribution of TRPV2 to the [Ca2+]o influx, we recorded the responses of LP-1 cells to rapid changes of [Ca2+]o from a calcium free to a 1.0 mM [Ca2+]o containing solution. LP-1 cells were transfected with TPRV2 or negative control vector, cultured in HBSS medium and exposure to a rapid increase of 1.0 mM [Ca2+]o at 30 s (s), confocal microscopy showed that a transient and rapid raise of green fluorescence in TRPV2 overexpressed group, which was obviously higher than control at 90 s, and reached the same peak phase at 250 s (Fig. 3a-c). By contrast, we investigated whether the inhibition of TRPV2 channel acts as a controller on the entrance of [Ca2+]o. Typically, DMSO-treated cells sparkled than SKF96365-treated cells during 70s to 250 s and the ultimate strength also convinced the result (Fig. 3d-f). Above results demonstrated that [Ca2+]o stimulation and TRPV2-induced regulation mediate the transient change in [Ca2+]i. Moreover, to further confirm functional effect of TRPV2 channel, RANKL expression induced by 1.0 mM [Ca2+]o were detected by qRT-PCR and ELISA assays. As shown in Fig. 3g and h, overexpression of TRPV2 conferred an increasing secretion of RANKL rather than a decrease in SKF96365-treated groups. Since inhibition of TRPV2 may reduce secretion of RANKL, we next assessed whether TRPV2 plays a role on the secretion of RANKL in MM cells. Consistent with our observations, myeloma cell could secrete RANKL , and high [Ca2+]o increases secretion of RANKL through activation of calcineurin/NFAT signaling in osteoblasts , and previous studies showing that both N-terminal and C-terminal region of NFATc1/NFATc3 contain calcineurin binding site [31, 32]. To confirm that highly efficient stimuli of [Ca2+]o activates the calcineurin/NFAT signaling in MM cells, we first examined the expression of calcineurin, the nuclear accumulation of NFATc3 (N-NFATc3) by Western blotting. Calcineurin and N-NFATc3 were increased with the treatment of 1.0 mM [Ca2+]o (Fig. 4a), demonstrating that the stimuli of [Ca2+]o could activate the calcineurin/NFATc3 signaling pathway in MM cells. Moreover, up-regulation of calcineurin and N-NFATc3 induced by 1.0 mM [Ca2+]o was further enhanced by TRPV2 overexpression and could be reversed by SKF96365, respectively (Fig. 4a and b). These results suggested that TRPV2 might modulate the secretion of RANKL via Ca2+-calcineurin-NFATc3 signaling pathway in MM cells. We then investigated whether NFATc3 binds to presumptive binding element of RANKL by ChIP assays. Nuclear extracts from TRPV2 overexpressed LP-1 cells or SKF96365-treated LP-1 cells were utilized for immunoprecipitation with NFATc3 antibody. More NFATc3 was bound to the promoter of RANKL in TRPV2-transfected cells as compared to NC (Fig. 4c). In contrast, SKF96365 notably reduced the binding of NFATc3 to the RANKL promoter (Fig. 4d). These data revealed that TRPV2 could activate NFATc3, which in turn bound to the RANKL promoter and induced at the transcriptional level. Taken together, our results indicated that oscillations of [Ca2+]i might be caused by the expression and functional change in TRPV2 channel and TRPV2 channel might contribute to the secretion of RANKL via calcineurin-NFATc3 signaling pathway in MM cells. To explore the capacity of TRPV2 agonist (Probenecid) in triggering the secretion of osteoclast-related cytokines. Firstly, we utilized Western blotting to investigate calcineurin/NFAT pathway, and our results suggested that Probenecid could trigger the activation of calcineurin/NFAT pathway, and 1.0 mM [Ca2+]o could accelerated this tendency (Fig. 5a). Moreover, to further confirm functional effect of TRPV2 channel agonist, RANKL expression induced by 1.0 mM [Ca2+]o and Probenecid were detected by ELISA assays (Fig. 5b). We utilized the SiRNA to knockdown TRPV2 expression in MM cells, and Ca2+-calcineurin-NFAT signaling is down-regulated in SiTRPV2 group compared to SiNC group (Fig. 5c and Additional file 6: Figure S5c). To investigate the possible role of TRPV2 knockdown in osteoclast differentiation, we co-cultured RAW264.7 with TRPV2-koncked down MM cells in high [Ca2+]o DMEM medium, numbers of TRAP-positive multinucleated osteoclasts (MNCs) (≥ 3 nuclei/cell) in the RAW264.7-SiTRPV2 MM co-cultured group were significantly decreased (Fig. 5d and Additional file 4: Figure S4b), this result show the same tendency with RANKL expression (Fig. 5e), both of them confirm the effect of TRPV2 knock-down in osteoclast differentiation.To investigate the possible role of TRPV2 in bone destruction, we co-cultured RAW264.7 with MM cells in high [Ca2+]o DMEM medium . Osteoclastic differentiation of RAW264.7 treated with MM cells compared with RAW264.7 was evaluated in vitro. Numbers of TRAP-positive multinucleated osteoclasts (MNCs) (≥ 3 nuclei/cell) were generated by each and dramatically increased in RAW264.7-MM co-cultured cells compared with RAW264.7 cells (Fig. 6a). Surprisingly, we found the number of TRAP-positive MNCs and RANKL expression in the RAW264.7-MM co-cultured group were significantly decreased after the treatment of SKF96365, the results showed the same tendency with TRAP staining (Fig. 6b and c) . As expected, western blotting and qRT-PCR showed that matrix metalloproteinase-9 (MMP-9) and cathepsin K (CTSK) were notably reduced in the SKF96365-treated cells (Fig. 6d-f). These results suggested that osteoclastic differentiation were increased in co-cultured cells and could be compromised by SKF96365. The outcome of MM has been dramatically changed with the advent of new drugs such as bortezomib and lenalidomide. However, the agents for MBD such as saline replenishment and bisphosphonates could only partially postponed the advancement of osteolytic lesions , and the progression of MM related osteolytic lesions was just begun to be defined . The destroyed bone remolding caused by the interaction in between myeloma cells and microenvironment cells was identified to play major role in pathogenesis of myeloma bone lesions [37, 38]. Here, we explored the possible role of TRPV2 channel in MM and identified its molecular mechanism in osteoclastic differentiation. 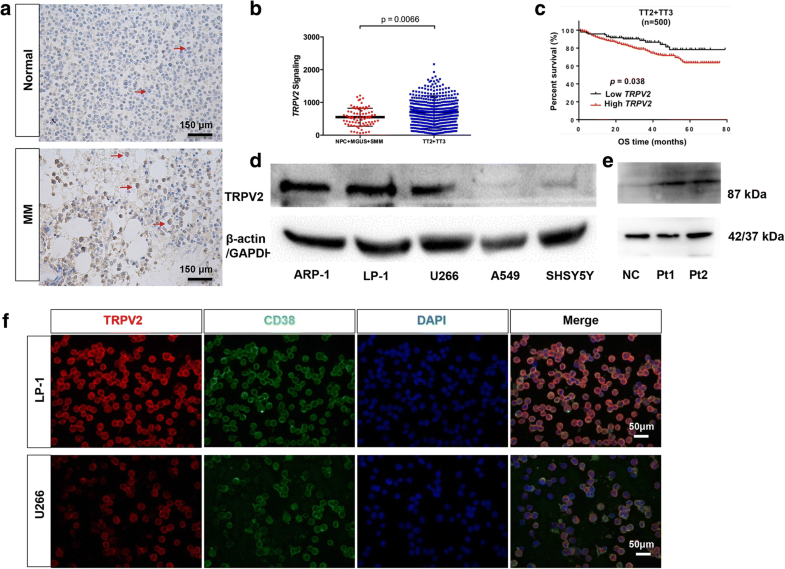 The activation of TRPV2 channel could increase the level of [Ca2+]i, which was involved in multifunctional processes, such as metabolism, molecular transport and gene transcription in tumor cells [39, 40], and TRPV2 channel was reported to be overexpressed in MM patients by microarray assay . However, little was known about the channel function in MM, especially in MBD. In our study, we found overexpression of TRPV2 and serum calcium was correlated with poor prognosis in patients with MM. High concentration of [Ca2+]o up-regulated TRPV2 channel expression in MM cells, the level of [Ca2+]i was mainly increased via stimulation of Ca2+ influx transmitted by TRPV2 channel, while inhibition with SKF96365 almost abolished the effect of TRPV2 on [Ca2+]i.. These results indicated a correlation between TRPV2 and Ca2+ in MBD. Notably, TNF-α and IL-1β are well-identified bone-resorbing cytokines that may contribute to the development of the myeloma bone disease in MM [41, 42]. Both TNF-α and IL-1β could synergize with RANKL to induce osteoclastic differentiation [43, 44], TNF-α was found to induce osteoclast formation at multiple levels, not only stimulate the secretion of RANKL by interacting with stromal cells , but also sensitized the osteoclast precursor cells to RANKL . Takami et al. reported that high Ca2+ could stimulate the secretion of RANKL and induce osteoclastic differentiation in a co-culture of osteoblasts and hematopoietic cells with osteoclastogenic factors free . RANKL produced by myeloma cell itself can directly stimulate osteoclast formation [29, 48]. In agreement with these reports, we found that [Ca2+]o up-regulation led to excessive secretion of RANKL in MM cells, which accounted for osteoclastic differentiation in co-cultured systems. Unexpectedly, inhibiting TRPV2 channel activity by SKF96365 abolished high [Ca2+]o-induced unbalance of the OCL/OBL differentiation and secretion of RANKL. Nevertheless, this result raised the question whether the reduction of osteoclast-related cytokines was due to TRPV2 channel suppression. Lee et al. expounded that high levels of [Ca2+]o-induced calcineurin/NFAT signaling activated the secretion of RANKL in osteoblasts . 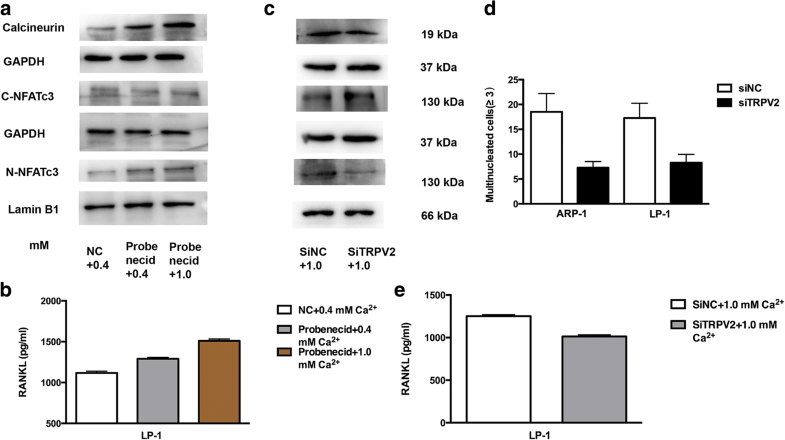 NFATc1 is an osteoclastogenic transcriptional factor and underwent nuclear translocation and auto-amplification with the stimulation of Ca2+-calcineurin signaling . The links between TRPV2 and NFAT activity were reported in osteoclastogenesis . Our findings were consistent with previous reports, TRPV2/calcineurin/NFATc3 was significantly increased after treatment with ramp up concentration of [Ca2+]o in MM cells, [Ca2+]i could induce calcineurin phosphorylation, which in turn led to NFAT dephosphorylation and nuclear translocation . NFAT is known as a key transcriptional factor for RANKL-induced osteoclastogenesis [52, 53]. Unexpectedly, high [Ca2+]o could activate calcineurin/NFAT to increase the secretion of RANKL in MM cells, indicating RANKL may be a downstream target of the NFAT. NFATc3 was confirmed to be directly bound to the promoter of RANKL in high [Ca2+]o. Inhibition of TRPV2 channel in LP-1 cells decreased the affinity of NFATc3 and RANKL. In general, our data revealed that highly efficient stimuli of [Ca2+]o could activate calcineurin/NFATc3 pathway through upregulation of TRPV2 in the membrane, subsequently, NFATc3 activation leads to the secretion of RANKL in MM cells via increased NFATc3/RANKL interaction. 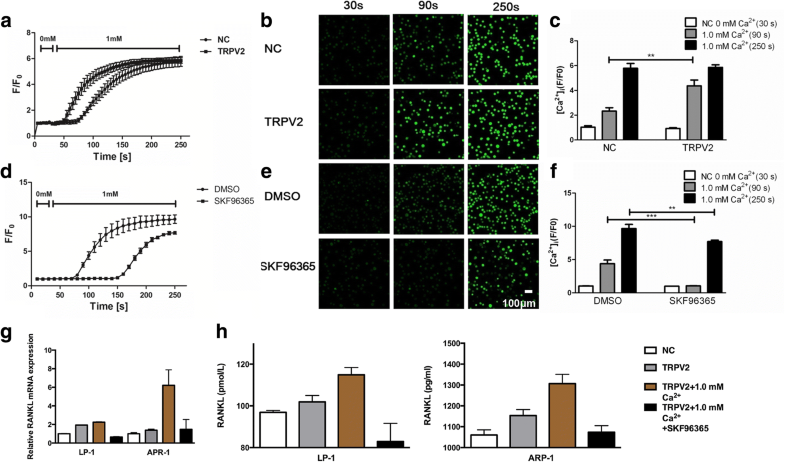 SKF96365 has been reported to regulate TRPV2 channel activation-induced calcineurin pathway in brown adipocyte differentiation . SKF96365 dramatically inhibited calcineurin/NFAT pathway and compromised the excessive secretion of RANKL by basal [Ca2+]o (0.4 mM) and high [Ca2+]o concentration. 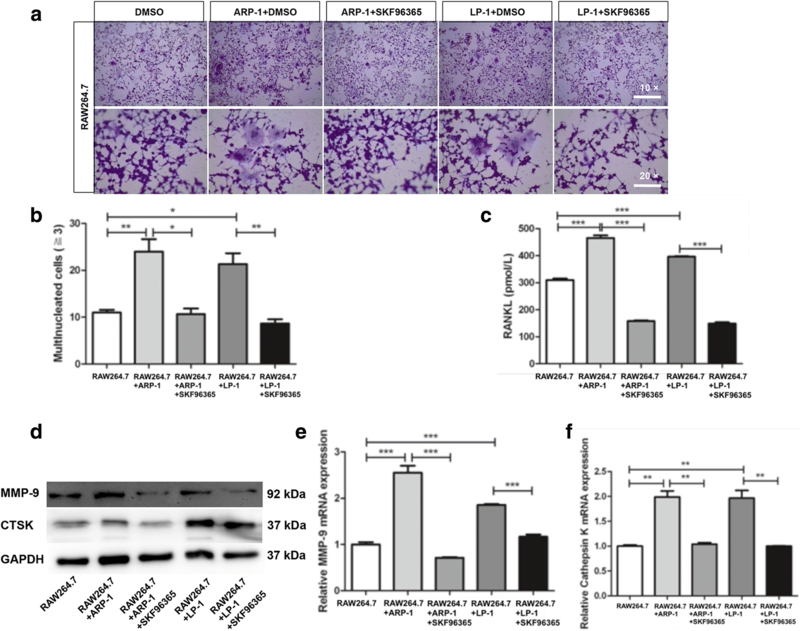 Furthermore, the inhibitory effect of SKF96365 on osteoclastic differentiation was demonstrated by the reducible expression of TRAP staining and osteoclast marker genes. In conclusion, our data showed that TRPV2 overexpression was correlated with poor EFS, OS and bone lesions in MM patients and involved in osteoclastogenesis by activating Ca2+-calcineurin-NFATc3 signaling pathway, leading to the excessive secretion of inflammatory cytokines and RANKL, which in turn involved in the progression of osteoclastic differentiation. Here, we uncovered a novel mechanism of MBD, and raised for the first time that SKF96365 could be potential candidate for treatment of MBD. Hua Bai, Huayuan Zhu and Qing Yan contributed equally to this work. This study was supported by the National Natural Science Foundation of China (81372540, 81670199). The datasets generated during and/or analysed during the current study are available in the Leming Shi repository, https://www.ncbi.nlm.nih.gov/geo/query/acc.cgi?acc=GSE24080 , and Shaughnessy JDrepository, https://www.ncbi.nlm.nih.gov/geo/query/acc.cgi?acc=GSE2658 , and Luca Agnelli repository, https://www.ncbi.nlm.nih.gov/geo/query/acc.cgi?acc=GSE6205 . HB, HYZ and QY contributed equally to this work. HB and HYZ designed this study, detected the cell biological function test, conducted the qRT-PCR assays, performed the statistical analysis, and drafted the manuscript. XXS and QY carried out the Western blot assays and RIP assays. JJW helped to draft the manuscript. XPL and JYL provided the clinical data and sample. LJC conceived the study, participated in its design and coordination, and helped to draft the manuscript. All authors read and approved the final manuscript. Clinical data was collected from the First Affiliated Hospital of Nanjing Medical University, written informed consent was obtained from all of the patients. The study was approved by the Ethics Committee on Human Research of the First Affiliated Hospital of Nanjing Medical University. Peng Q, Luo A, Zhou Z, Xuan W, Qiu M, Wu Q, Xu L, Kong X, Zhang M, Tan W, et al. Interleukin 29 inhibits RANKL-induced osteoclastogenesis via activation of JNK and STAT, and inhibition of NF-kappaB and NFATc1. Cytokine. 2018. https://doi.org/10.1016/j.cyto.2018.06.032.